Federico Delbonis beat third-seeded Borna Coric 6-2, 6-4 on Sunday to clinch the clay-court Grand Prix Hassan II for his second career title. The Argentine was more consistent on his serve in their first-ever meeting, winning 80 percent of first-serve points and saving the three break points he faced against Coric. Delbonis, who broke Coric's serve three times, won his first title two years ago at Sao Paulo on indoor clay. 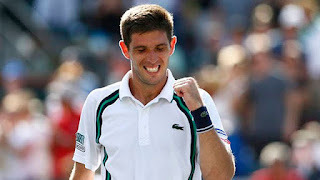 "I'm very happy to win again on the ATP World Tour," said Delbonis. "I played at a great level today and it's great to lift the trophy here. I took my chances, but it was not easy. In the end, I did my job and got the victory. This is what I work for. To win at this level, you have to be mentally focused the whole match." Coric, ranked 48th, lost his other career final in January on an outdoor hard-court at Chennai, India. "It was a tough match for me today," said Coric. "I didn’t find any solutions. I had an opportunity in the second set but unfortunately I couldn’t break him. Nevertheless, I’m happy with my start in the clay season and I’m looking forward to Monte-Carlo." Guillermo Garcia-Lopez won his first title in nearly four years after rallying to beat fourth-seeded Marcel Granollers 5-7, 6-4, 6-3 in an all-Spanish final on clay at the Grand Prix Hassan II on Sunday. The previous title for the 30-year-old Garcia-Lopez was on indoor hard courts in Bangkok back in 2010, and he had lost his previous two finals - last year on clay at Bucharest, Romania and on indoor hard courts at St. Petersburg, Russia. Granollers, who was bidding for his fifth career title, dropped his serve five times and was less consistent. The 28-year-old Granollers won only 60 percent of first-serve points compared to 76 percent for Garcia-Lopez, who won their only previous meeting in the second round of the same tournament in 2010.